A Living Will is an important document to have at any stage in your life. It is a legal document that is drafted to express your wishes regarding end-of-life care. Without a Living Will in place, some of the hardest and most important decisions of your life can be left entirely in the hands of medical professionals and loved ones. Not only do you risk having a decision made that you might not support, family members may be forced to make up your mind for you, often leaving them feeling unsure they have made the right decision. However, you can ensure your wishes are carried out as you intend with a Living Will. 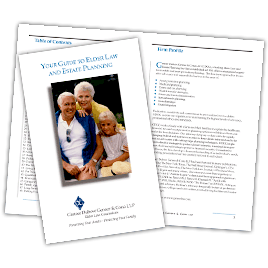 The experienced Elder Law attorneys at Genser Cona Elder Law will work closely with you to explain your options so you can rest easier knowing you’ve put the proper documents in place. A Living Will is a document in which you express your wishes regarding end-of-life care. You specify your wishes regarding the use of life-sustaining treatments such as artificial nutrition and hydration, pain management and the administration of CPR. By signing a Living Will, you make decisions for yourself now. Your loved ones will never be faced with making these critical and difficult decisions for you. It’s a wonderful gift to remove this decision-making burden from your loved ones’ shoulders. Your family may be overwhelmed with emotions and information from physicians. To make matters worse, many families fail to have these tough discussions. Even if you’ve had the difficult conversation, emotional distress can at times push the family into making decisions against the wishes of their loved one. Each state has different requirements for a Living Will. In New York, a Living Will works in conjunction with a Health Care Proxy. The agents named in both documents must be the same. A health care proxy is someone you designate to communicate with doctors and make medical decisions in the event you are unable to do so yourself. This person must be someone you trust to fulfill your wishes and ensure you have the best level of care. You should choose someone who knows what decisions to make regarding your medical care and be sure to discuss your wishes with them. Whether it be a case in which you are incapacitated with a possibility of recovery or even an end-of-life decision, you need to ensure you are clear about what decisions should be made. The attorneys at Genser Cona Elder Law are experienced and ready to help you create a plan for your peace of mind. We can assist you in making sure your wishes are communicated well, and your health care proxy fully understands his or her role in your life planning. We can also ensure your documents are maintained in a safe location and easily accessed when they are needed. With the guidance and assistance of the attorneys at Genser Cona Elder Law, there’s no need to fear the unexpected. We’ll help you create a plan so you can spend more time enjoying today and rest easier knowing you’ve put the proper legal instruments in place for tomorrow.